PORTLAND, Ore. – June 26, 2014 – Big jobs require big power. 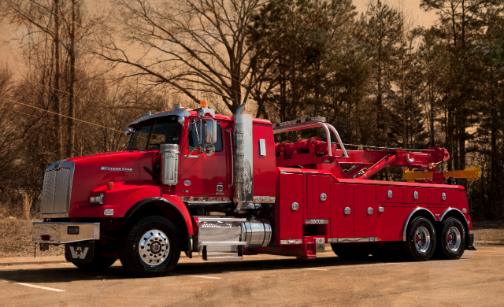 That’s why Big Red Towing in Syracuse, NY, depends on their Detroit™ powered Western Star 4900 trucks to get the job done. 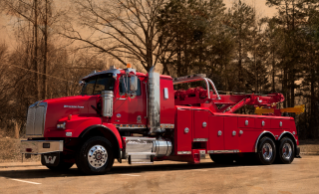 After Big Red Towing added its first Western Star – a 4900SB with a Detroit™ DD15® engine – to its fleet, they were so impressed with the truck’s performance they recently added a second. The new viper-red Western Star 4900SB has a Detroit™ DD16® engine, an 18K front axle, a 46K rear tandem axle, and a 40-inch sleeper to accommodate a clean back of cab. The truck also features a Century 1130 rotator towing and recovery unit and a custom winch brake that provides even more stability while winching large, heavy objects. For more information about Western Star or to find a local dealer, go to www.WesternStar.com or call 866-850-STAR (7827).